After 70 years of gracing the comic books. The creators of Batman finally decided to rest their hero. Super Heroes dying is a current fad today, with Captain America dying on the hands of a sniper in New York last year, Superman from Doomsday last 1992 (which resurrected again). There are rumours that Batman will suffer a gruesome end when his sidekick Robin goes over to "the dark side" and destroys him in a terrible betrayal. Others speculate that Wayne may either retire from his duties or be killed by a mystery villain known as the Black Glove. Batman #676-681 a.k.a. Batman R.I.P. revealed that the story details the attempts of the mysterious Dr. Simon Hurt and the "Black Glove," a criminal organization dedicated to corrupting virtue, as they attempt to destroy Batman and everything he stands for. Using a mixture of physical and psychological attacks, the Black Glove tests Batman's resolve, forcing him to temporarily adopt the crazed persona of the "Batman of Zur-En-Arrh." He is then led to Arkham Asylum to face The Joker. 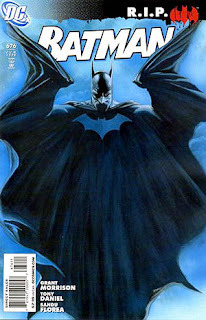 Seemingly defeated, Batman is buried alive by the Black Glove, a group that includes Bruce Wayne's girlfriend, Jezebel Jet, who has betrayed him. With the assistance of Robin, Nightwing, and the Club of Heroes, he turns the tables on his foes. In a final confrontation with Dr. Hurt, Batman is caught in a helicopter crash and feared dead. Six months later, a villain named Le Bossu tortures a Gotham City policeman, enjoying the freedom villains have now that Batman is gone. Suddenly, the Bat-Signal shines into his lair. In March, April and May a three-part series titled Battle for the Cowl, written and illustrated by Tony Daniel will focus on the aftermath of the series and the battle for Gotham.Tied to this will be a three-part Oracle mini-series and a three-part Azrael mini-series and two bookends titled Gotham City Gazette that encompasses the changes in all of those series. In addition, five one-shots will be published focusing on key characters in upcoming storylines. These will feature Man-Bat, Commissioner Gordon, the Network, the Underground and Arkham Asylum.